This article is comprised from information taken from a registered and purchased National Geographic program, thus the information and pictures are copyrighted by them. While it should be quite evident that some of the pictures were taken, originally, far earlier than 1982, the date of the article/issue is November, 1982. National Geographic The Chief Priest of the Snake Clan of the Hopi People - His face and body are smeared with black and white and yellow paint. 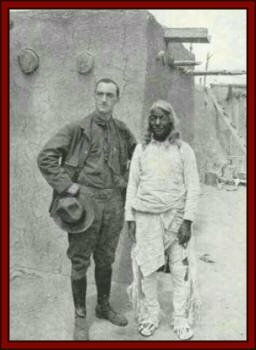 His ornaments are many: a gray fox skin dangles from his back; on his legs are bound shells of the desert terrapin with points of antelope hooves inside to serve as rattles; eagle feathers are carried in one hand, with which snakes are stroked and pacified. A prayer stick is also in his hand. Some claim that the priests drink and herb tea before the dance which renders them immune to the poison, but all agree that the fangs of the snakes are not extracted. Throughout their history the Hopis have been aided by isolation in their remote mesas. 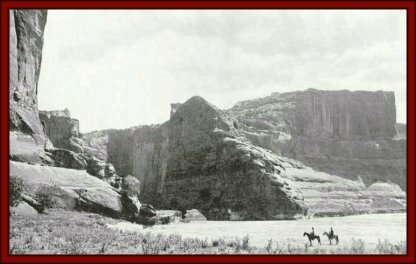 Down through the centuries there were occasional raids by Apaches and Utes, but they were far fewer than the attacks on the Pueblo Indians of the Rio Grande area. The Hopis were relatively unaffected by the Spanish and the Mexicans, who ruled over what is now New Mexico and Arizona from 1540 to 1848. 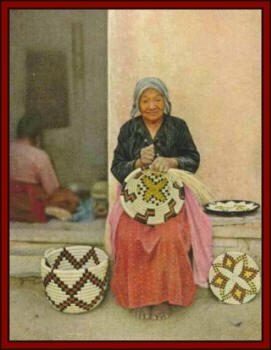 Some of the buildings that the Hopi live in are called kivas. A ladder descends from a hole in the roof, this symbolizes access to the underworld from which the Hopi people originally emerge. 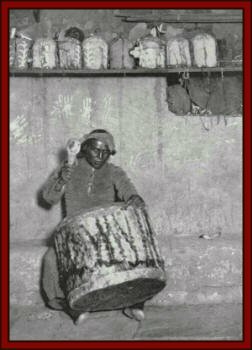 In late winter the kivas throb with drumbeats as kachinas dance well into the night. 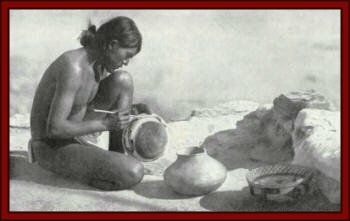 Appealing to the spirits for a successful crop, a man casts offerings of cornmeal before tending his fields. Hopis grow more than 12 varieties of corn with short stalks and deep roots to trap moisture deep within the dry soil of the area. 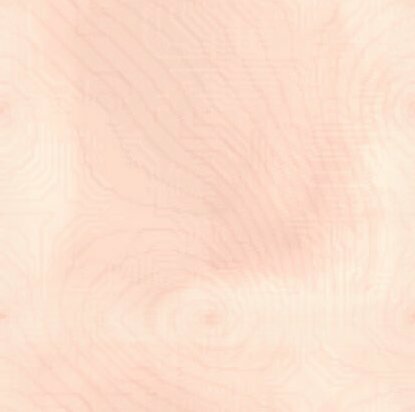 National Geographic The untutored art of the American Indian, with its lively appreciation of color values and combinations, and of geometric designs, has been praised by the art critics of every land. (Although, I have an idea that had they simply asked them, the Hopis could have told them where it was all along…Snow Owl). 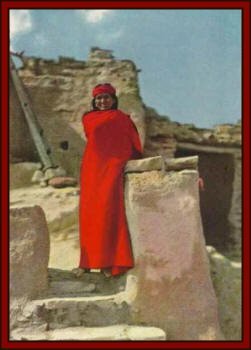 National Geographic Hopi Indian and his home - The brilliant red of his blanket proclaims the success of the SW Indians in producing Colors. 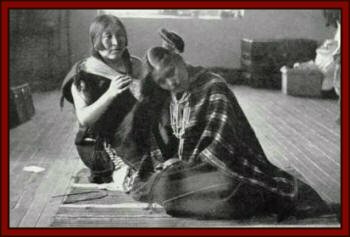 Some tribes were able to make multi-hued blankets with the delicate shadings of the finest art embroidery, the weaving being so perfectly done that one cannot tell the right and which is the wrong side. National Geographic Hopi Boys of Walpi, Arizona - It is said that Walpi has a cliff-top location comparable to the monasteries of Meteora, Greece. 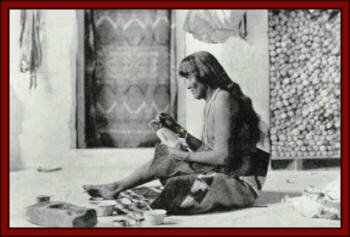 National Geographic Hopi girl of the Walpi (Place of the Notch). 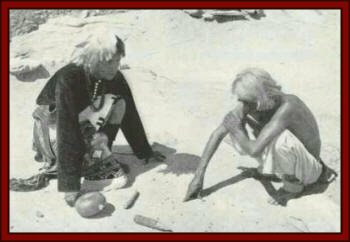 National Geographic Hopi elders in discussion. 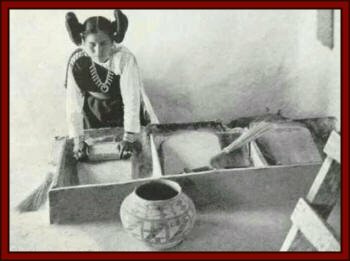 A Hopi Hair Dresser - Unmarried girls among the hopi parted their hair in the middle from the forehead to the nape of the neck, and arranged it in a large whorl above each ear, a very distinctive style distinctive of the squash blossom. However, as the girls became educated this picturesque fashion fast disappeared. 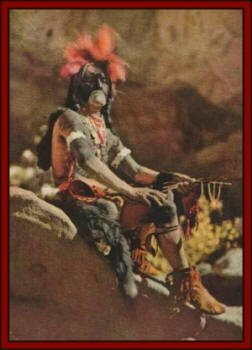 Hopi Kachina Artist - Many kachinas are personalities of clan ancestors, while others are beings of unknown significance, but possessed of magic powers – these are in addition to the known ones which have distinct functions. 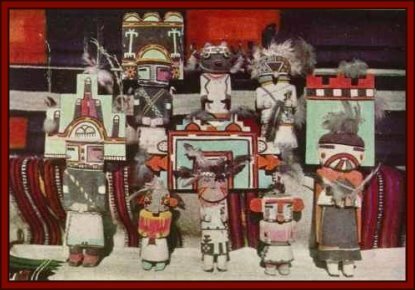 Each kachina is said to be endowed with individual characteristics and is represented in at least six different symbolic colors. National Geographic Hopi Kachinas for the Tourists of the day.